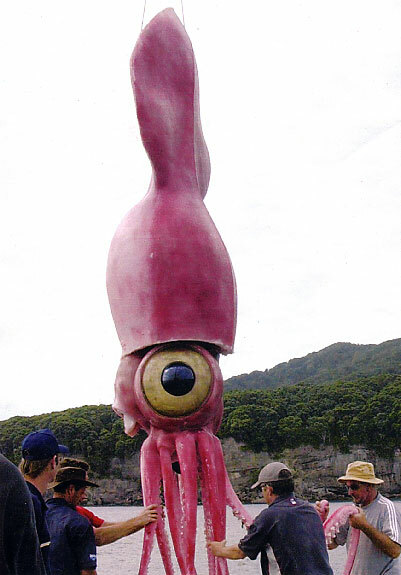 Thread: Worship the colossal squid, puny humans!!! Am I the only one here who saw this in the paper at the weekend has been completely disturbed by (and eerily attracted to) it ever since? An acquaintance had to physically cut the photo out of the paper and send it to her boyfriend to stop her obsessively looking at it and Getting The FEAR. Can we have a colossal squid smiley for Dissensus now? my girlfriend just told me this is an immature species - they grow up to 3 times that much !!! is'nt that a brilliant animal ?? you could train it up and have whirlitzer carts on each of its tentacles and get it to spin around in the water and it would be the best fairground ride ever!! Last edited by mms; 13-09-2005 at 08:40 PM. that's... not real is it? I bet it absolutely reeks too. Has everyone seen this video? I think a healthy respect for anything with tentacles is in order. I've read several instances of giant squid washing up, etc. but that photo at top of thread really does look fake to me. The colour, but mostly the texture... it doesn't look at all dirty or sloppy and decaying, and I'd expect it to be at least one of those from other photos I've seen. Maybe it's a left over from an old Doctor Who set? It looks like papier mache or something. I've got the cutout from the Grauniad Sep 10 in front of me right now. It's just awesome. It looks like something out of Futurama. "Extreme Nature" by Mark Carwardine (out in October according to a quick google). - does it have two of those eyes? - can the eye be used as a football for a good kickabout? - can we have one for the London Aquarium please? made MY day that's for DAMN sure. Do not doubt the awesome power and god-like existence of the colossal squid, 2step and Michael! I'm sure the species of squid exists, but look at the article linked to on your own blog and compare the images there with that thing from the Guardian... Same purported species and all... It looks sooooo different. And so unlike any smaller squid. Check this particular pic from that BBC article. No signs of big eyes, no undercoat-of-housepaint-on-papier-mache stylings. 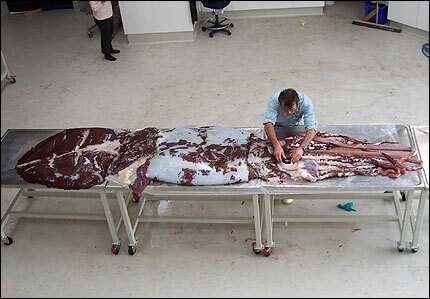 What about a 7 metre squid with huge tentacles with elbows? I went all cold looking at it. once when i worked at an advertising agency (WCRS) as a practically intern-level junior employee (first job) as a prank i left a 3 foot-long squid on the star creative's desk when he was out at lunch. jon, that squid isnt real. is it? You sceptics will be first up against the wall when the Church of the Colossal Squid is in the ascendancy!!! What about this diagram from Confucius' last link, then? It's not the same species, but it still has "volley ball-sized eye". And is it likely that Collins would stick plastic invertebrates in a coffee-table book about weird nature? LET THE COLOSSAL SQUID INTO YOUR HEARTS, BROTHERS AND SISTERS!!! Charming! What did he do to deserve that?